Created from youth group leaders feedback. Space to store gear and hold group meetings, whilst retaining small pack sizes and lighter trek weights. Large stand up height front porch and a lower bedroom to keep the users warmer. A 3 person, inner first pitch, fully geodesic tent with expedition doors, gear loops in the inner tent, and the ability to internally guy for extra strength. 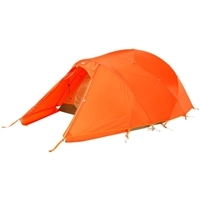 At just 4.4kg, the XPD 3 sets a new standard of Expedition Tent.